• Video from CD Release concert! 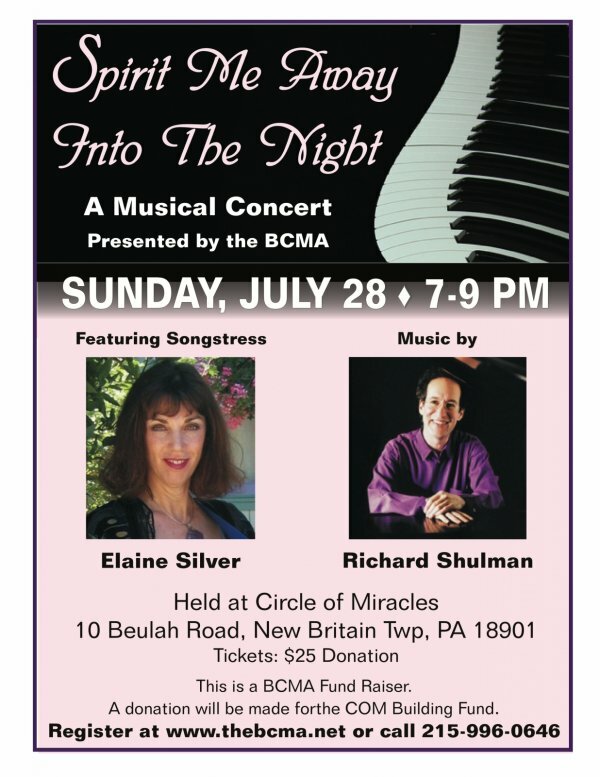 The Bucks County (PA) Metaphysical Association is sponsoring a concert at Circle of Miracles Church, New Britain Township Sunday, July 28th, 7:00 pm with Richard Shulman and Elaine Silver. See "Upcoming Events" for a workshop "Experience the Oneness Through Music" at the church with myself and Elizabeth Joyce on 7/27 and a concert with Elaine and myself on 7/26 in Morristown, NJ. "Angels of Blessing" written with Elaine. Here's a Youtube video from our CD release concert of Bliss of Being, with The Pure Heart Ensemble, at White Horse Black Mountain. Video by aVideoGuy.com. Enjoy! This is a solo piano Piece called "Resting in God." To Purchase "Bliss of Being"
More info in "Upcoming Events" below! 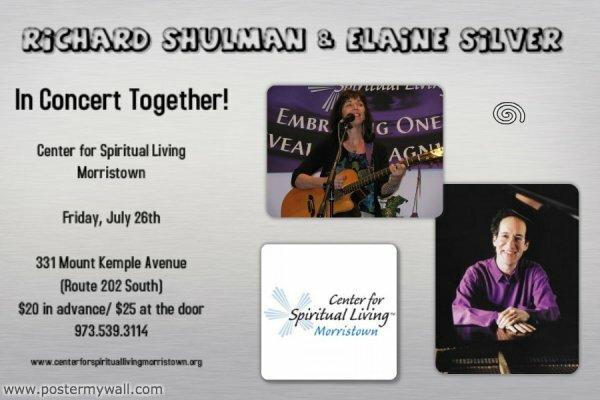 Friday, July 26; 7:30pm; Center for Spiritual Living - Morristown, Concert with Melt-Your-Heart singer-songwriter Elaine Silver. 331 Mount Kemble Avenue, Morristown, NJ. $20 in advance / $25 at the door; 973/539-3114; www.rsci.org. 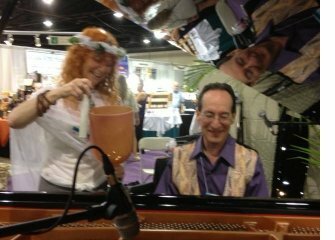 "Experience The Oneness Through Music"
Richard Shulman and Elizabeth Joyce offer an afternoon of healing and raising your vibration to higher levels. This workshop will focus on your inner healing and the Universal Presence. 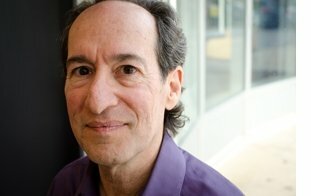 Through meditation, exercises, and Richard’s music, you will be taken on an inner voyage of God-Realization. This is a world where the rules that support our belief system are changing before our very eyes. Through this Workshop, we learn the true nature of who we are. Oneness provides humanity with a startling, new Vision of Reality – taking us to the outer reaches of our own humanity and to the depths of our Divinity within. In this process, we come to realize the significance of our choices, and that every Soul is here, by choice, living and thriving in these extraordinary times. Enlightenment is within the reach of everyone! Abundance Exchange $75.00 – if you attend both the workshop and concert – you will receive a $10 discount. To Register click HERE. Sunday, July 28, 2013 7:00-9:00 pm Circle of Miracles Church Spirit Me Away into the Night! A Musical Concert presented by the BMCA with Richard Shulman and Melt-Your-Heart singer-songwriter Elaine Silver. 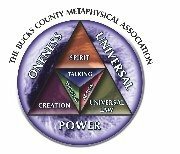 Fundraiser for the Bucks County Metaphysical Association; $25; To register: 215/996-0646 or www.thebcma.net. Click on the photo to see the short video on Facebook!